Optivida Silver Solution works more efficiently than colloidal and ionic silvers to accomplish numerous positive functions within your body. Suggested Usage: Adult: Take 1 teaspoon up to 3 times during your day. For children: 1/4 to 1/2 teaspoon once a day. 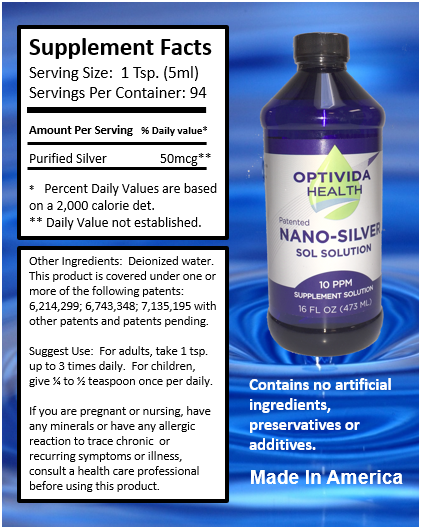 Optivida Silver Solution is an engineered silver solution supplement designed to give your immune system a boost; 10 PPM. By using catalytic instead of chemical action, Optivida Silver Solution helps speed up natural processes that have positive effects throughout your body. Unlike colloidal and ionic silvers, which quit working after completing one function, Optivida Silver performs over and over for hours. By resonating at just the right frequency, Optivida Silver Solution disrupts foreign elements without disturbing your body’s natural environment.